Preheat oven to 350°. Coat a 9×13-inch baking pan with nonstick spray. Line pan with parchment paper; coat with nonstick spray. Process graham crackers in a food processor until crackers are a fine crumb. For the crust, melt butter in a large saucepan over low heat, about 2 minutes. Stir in sugar and salt until dissolved. Remove mixture from heat. Stir in cracker crumbs. Press crust into bottom of prepared pan. For the bars, layer crust with chocolate chips, peanut butter chips, coconut, and peanuts; drizzle sweetened condensed milk over the top layer. 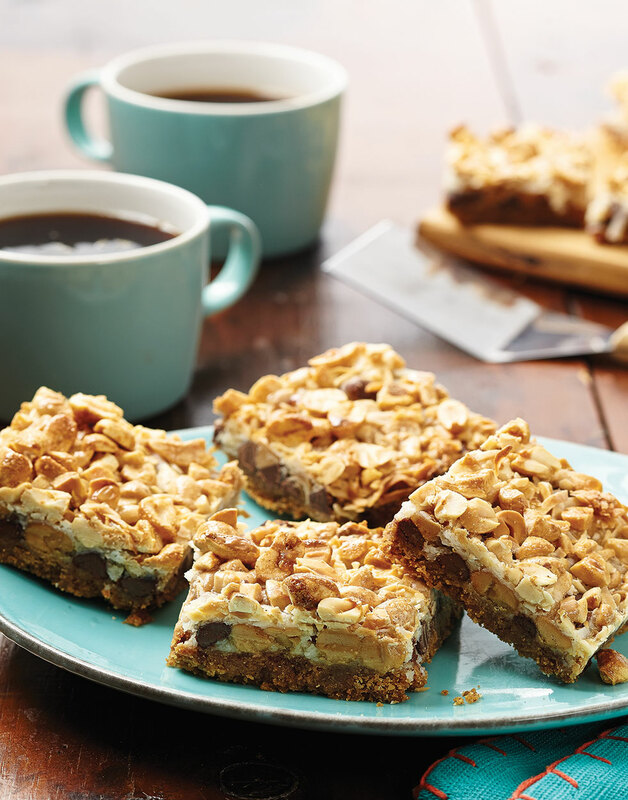 Bake bars until nuts and coconut are lightly toasted, 35–40 minutes. Cool bars in pan on a rack, 45 minutes, then refrigerate at least 2 hours. Place cutting board over pan and invert. Tap bottom of pan to release crust; peel off parchment paper. Cut bars, from graham cracker side, into 32 servings.